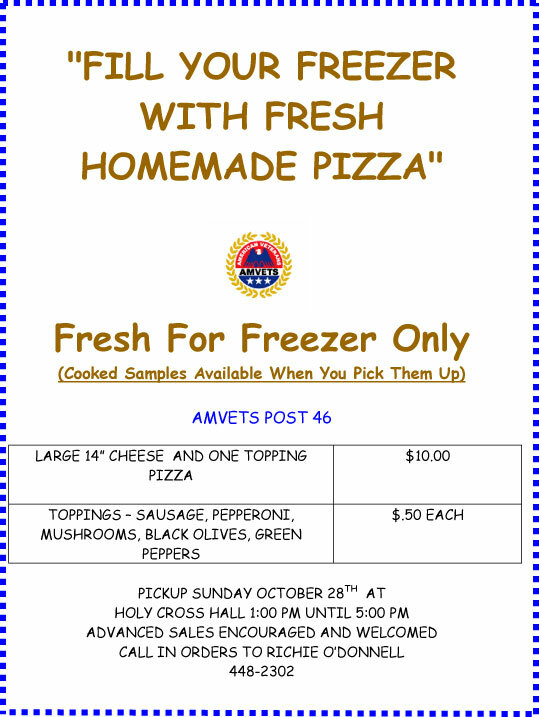 Sunday, October 28, 2007, from 1-5 p.m. Please help us reduce mailing cost by renewing your membership on line. The new 2008 membership form is posted on your Chamber of Commerce web sitewww.beaverisland.org . Here is a direct link to the membership information and renewal form. http://www.beaverisland.org /2008-membership/index.html You can print the forms if you wish or simply provide the information requested on page 3 via e-mail and mail your check to the address shown. B I C of C / PO Box 5 / Beaver Island, Mi. 49782. In many cases your directory information will remain the same or consist of just a few changes. If that is the case simply send an email to chamber@beaverisland.org or chamber@csyip.net . An example e-mail is shown. Please change my listing as follows: the weekly rental price to $1800 and the e-mail to ............................. The rest will remain the same. I mailed my check in the amount of $000.00 on 10-30-07. Thank you. Watch for our ad in the November issue of the Beaver Beacon and Northern Islander. It is a sharp looking light gray logo shirt. On the back it says, "Welcome to Beaver Island Some of us Live and Work Here." Every member should have at least one. About 50 Irish from Arranmore Ireland and Chicago held a “Hooley” (an Irish evening of music, song and dance) at Holy Cross Hall on Oct. 6. For the second year in a row, the Chamber of Commerce, in a gesture of goodwill from the Beaver Island community, allowed the Irish group to use the hall after the Bite of Beaver Island Festival, and also offered the group their insurance and liquor license for the event. “The Chamber is pleased to be able to help islanders discover more about their Irish heritage,” said Executive Director Steve West. The non-profit organization that presents "Baroque on Beaver" each year and recently presented the "Chenille Sisters" in concert right hear on Beaver Island is named the Beaver Island Cultural Arts Association. Part of their mission is to provide arts exposure to the students of the Beaver Island Community School. 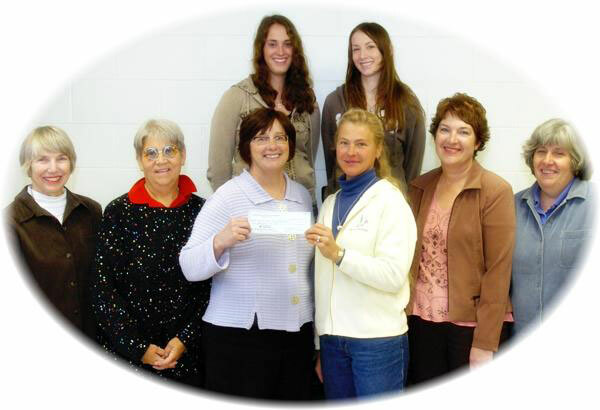 The BICAA presented a check in the amount of $2000 to the school to help support the Strings Program. Thank you to Jeff Cashman and the Beacon for this photograph. Beginning November 5, the Station starts opening at 11:00 am. These hours are from November 5 to April 30, 2008. Except for Christmas there will be a hopper outside on the Holidays. On Christmas Day, we do NOT leave one out because the hoppers are for people leaving the Island , and neither the boat nor Island Airways are open. The hopper will be put out at 5:00 pm. 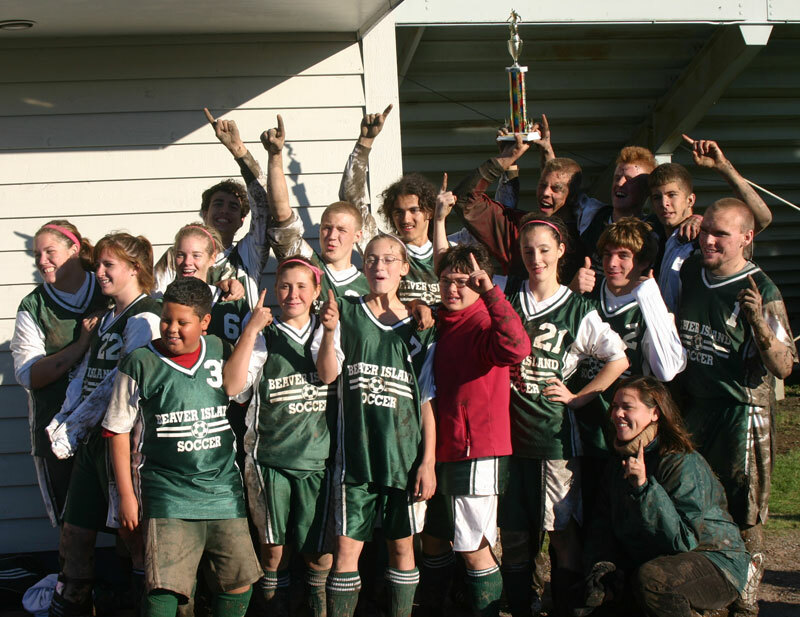 In a very exciting day today, Saturday, October 20, 2007, the Beaver Island Community School soccer team played very hard to a tie with Paradise after winning a game against Hannaville. Because the total amount of playing time cannot exceed 180 minutes, no overtime was allowed. The only choice was to have a shoot-out. One-on-one, a player shooting on goal against a goalie. Due to the skills of the entire BICS team, but particularly to the skill of Eric Albin as goalie, Beaver Island won the shoot-out and progressed to the finals against Mackinac Island. The two Island teams, Beaver and Mackinac, battled to a one to one tie. 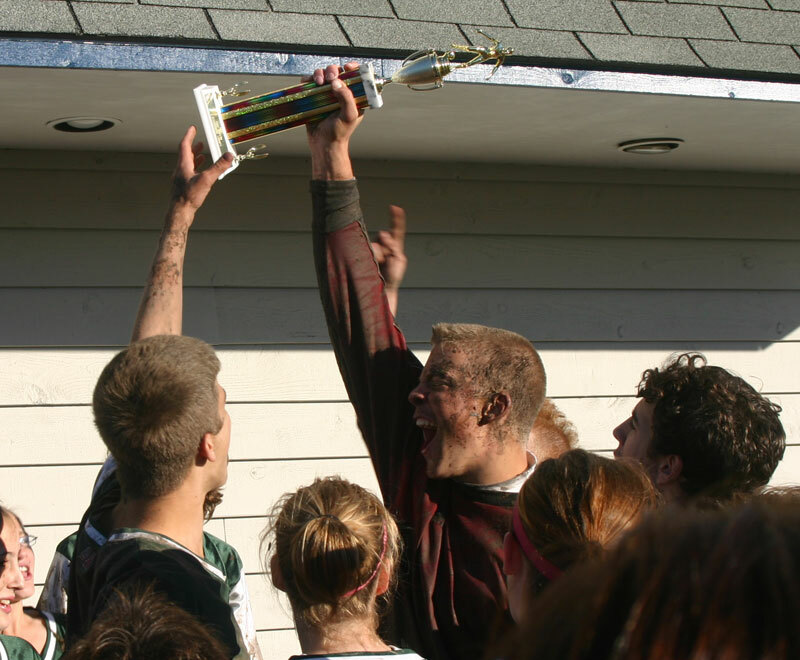 Beaver Island won the shoot-out and therefore won the Northern Lights League Tournament. Pictures and more story to follow in the next day or so. Congratulations to Beaver Island for first place in the NLL Tournament and to Mackinac Island for second!! Lisa Rose is a visiting paramedic. She provides advanced life support services to the Island residents and visitors when she is on the Island, and she taught two paramedic classes right here on Beaver Island with co-instructors Steve Rose and Joe Moore. Lisa has island ties. Her mother and father lived and worked on Beaver Island. Can you name her mother and father? The only person responding was Mary Palmer with a correct answer. Her father, Omar McCann, owned the store down on the main drag by the boat dock. The McCann family has quite a history on Beaver Island. 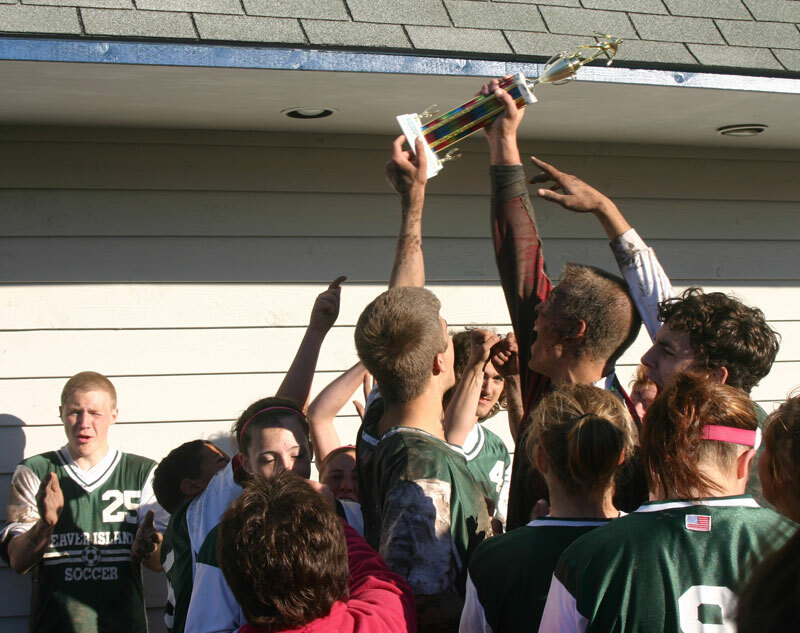 The Beaver Island Community School's Soccer Team has won the NLL Soccer Tournament in the Soo under the leadership of Marianne Brown, their coach, and three seniors, Brenden Martin, Dan Runberg, and Eric Albin. The coach who served the team previously was Mike Myers. How many years was he the soccer coach? The first correct answer will earn a gift subscription to News on the 'Net for the months of November, December, and January for the person of your choice. Email your answers to medic5740@gmail.com. 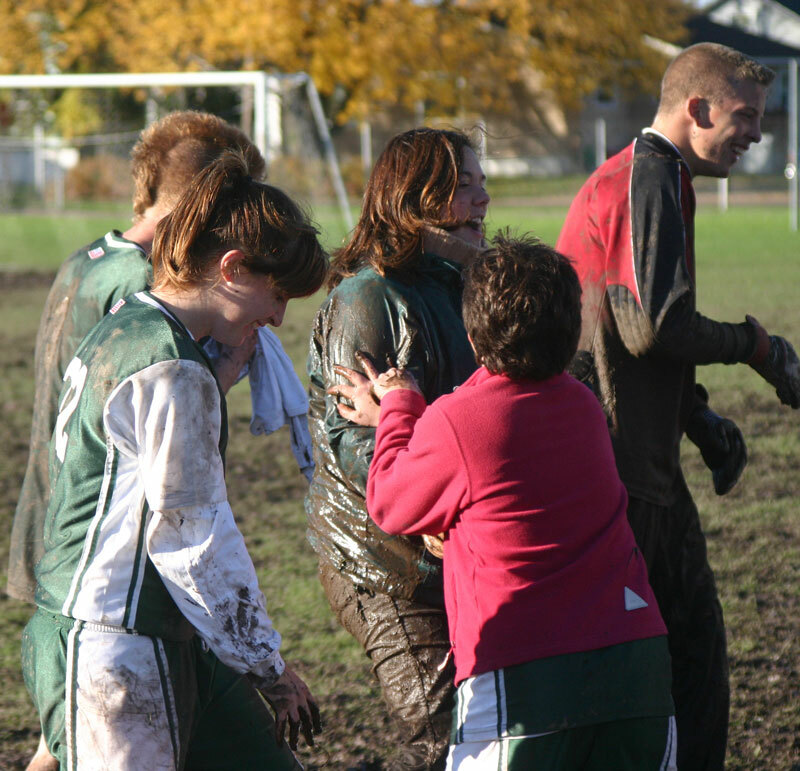 Marianne Brown sent this excellent report on the tournament held in Sault St. Marie, Michigan, on Saturday, October 20, 2007. The Islanders flew direct to the Soo Airport, courtesy of the Sports Boosters, using three Island Airways Britten Norman Islanders. Game 1: Hannahville – The starters (Brenden, Bryan, Dan, Dereck, Jenna Butler, Kristy, Cameron, Patrick, Maeve, Alex, and Eric) played the first 10 minutes of the first half and scored 6 goals (5 of those coming from Brenden). The younger players then played the remainder of the first half (I left Dan in to keep things under control… just in case!) 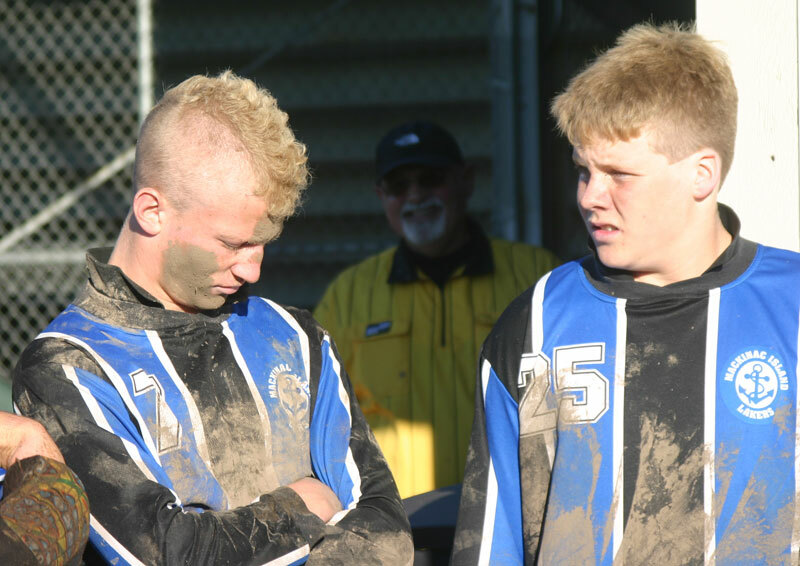 The 8 th graders made up the 2 strikers and 2 midfield wings… Brighid and Jenna were both VERY close at goals but the muddy conditions were tough to handle. I made the conscious decision during half time that we needed to end this game since I knew we would need all the legs we had for the remaining 2 games that day. All the starters finished off the game about 4 minutes into the second half. Stats: Goals – Brenden (5), Cameron (1), Dan (1), Bryan (1). Assists – Dereck (2), Dan (1), Brenden (1). Game 2: Paradise – Field conditions getting worse… much worse. Paradise is a good team, no doubt and they play a great defense. We struggled to get anything going during the game and I think panic started to set in about half way through the second half. Blind passes, little hustle, and not finishing with good shots became our problems. (The captains (Dan, Brenden, and Eric) and I knew there would be no overtime because of the MHSAA rule of only 180 minutes of soccer can be played by a player in one day so since a winner was needed a shoot out is how a tied game would be decided.) Our (especially Eric's) worst fear was realized when the end of the game whistle blew. The rules were laid out, first five kickers would kick, if there was still a tie the next round of different kickers would go head to head (kind of like sudden death). 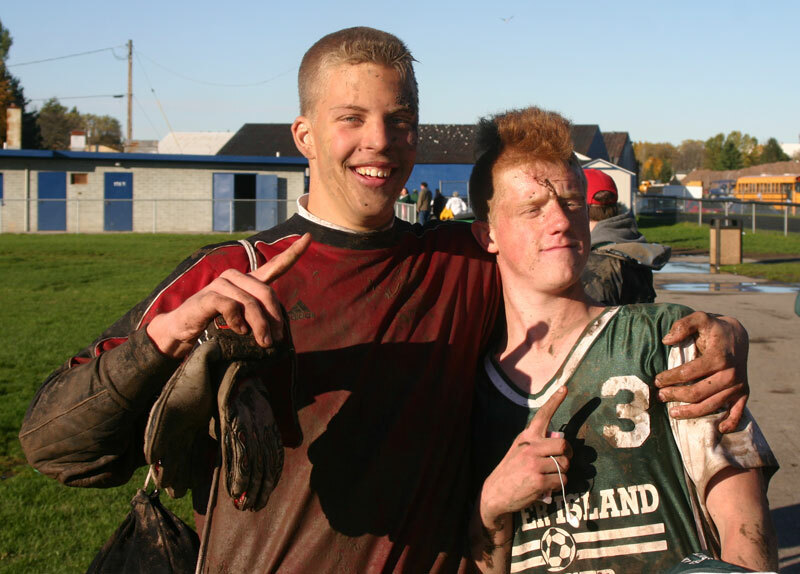 Paradise kicked first – goal, Dereck kicked second – goal, Paradise #2 – save Eric! !, Dan #2 – save (uhhh), Paradise #3 – save Eric! !, Brenden #3 – goal. We have the led 2-1!! Paradise #4 – goal, Eric #4 – misses high. Tied 2-2. Paradise #5 – SAVE ERIC!! Cameron #5 – GOAL!!! 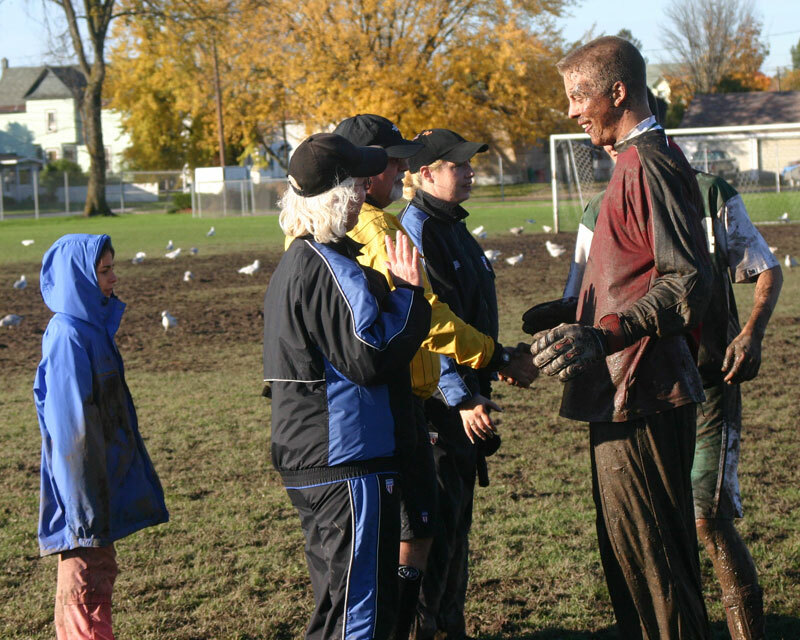 Game 3: Mackinac Island – Field conditions are worse much much worse! 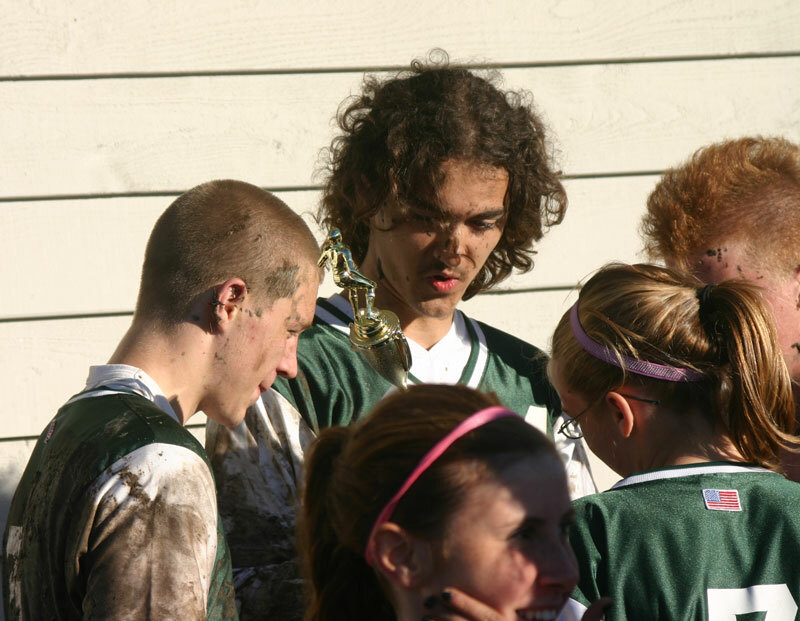 The last time we played Mackinac our greatest problem was Robert Chambers. He camps out as one of MI strikers and he has a great deal of speed!! The rest of the MI players always look to pass him the ball. Before the game I said to Dan your one and only job this game is to shadow Chambers! Dan knew his job and he executed it perfectly. Our defense won this game for us! MI scored early in the first half but no more than 5 minutes later Brenden answered to tie the game. We would stay at this tie for the remainder of the game. But I have say (and I may be biased) that Beaver Island dominated the play in the second half! The Mackinac Island coach said it perfectly during and after the game, “they (BI) wanted it more than we (MI) did” and it was obvious! As the whistle blew to end the game in a tie I was mysteriously confident because I knew that we had the stronger keeper and a deeper bench of quality shooters! Same rules as before… MI kicked first (Chambers) – save Eric!, Dereck #1 – too close to call from the bench but the official called it a save, MI #2 – goal, Dan #2 – save, MI #3 – save Eric, Brenden – Goal! Tied 1-1. MI #4 – goal, Eric #4 – save. MI up 2-1. Eric must make the save for the shoot out to go on. MI #5 – SAVE. Cameron must score to continue the shoot out. GOAL!! Now the shoot out goes head to head. MI #6 – SAVE ERIC! Bryan is the next to shoot, if he scores the game is over… (I failed to tell him this before he went up to shoot… now that I think about it later… I think that might not have been a bad mistake!!) 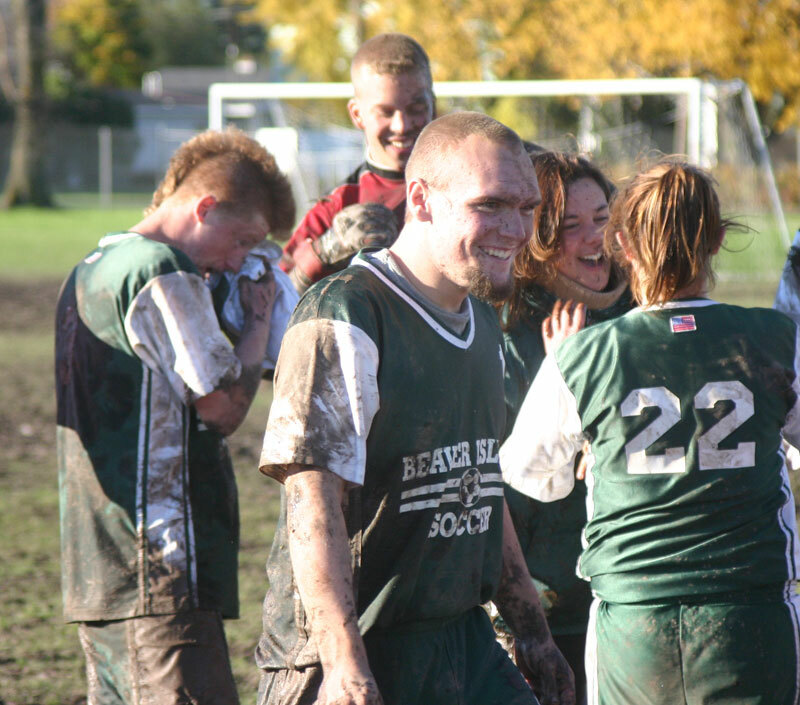 Bryan scored and after a brief delay of confusion the rolling in the mud (myself included) began and the medals were handed out. 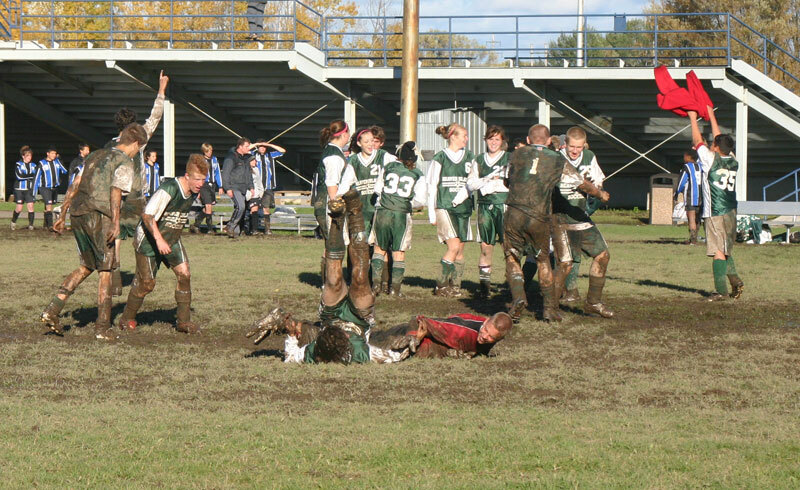 Pictures of the Mackinac Game are here. There is no doubt that this tournament title would not have been possible without the leadership of the seniors. These boys played great defense, stayed focused and lead the team all the way to the mud pit! 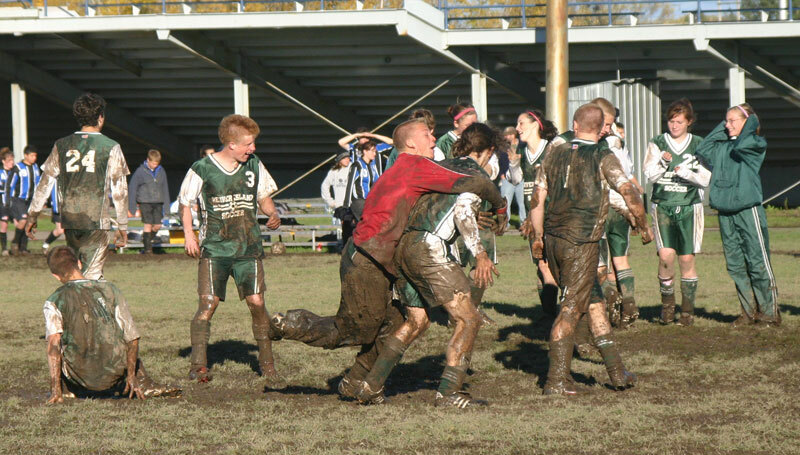 Teamwork was the key… each person did their job all the way down to Michael McCafferty-Myers switching shorts with Dereck half way through the first half in the Mackinac game because Dereck couldn't even run down the field without having to hold up his shorts because they were so wet and heavy. What a day, what a day! Pictures of the return trip from the Soo are here.